Today was a near perfect autumn day. The temperature was comfortable enough to be out working and not be cold or too warm. We had rain most of the day yesterday so the ground was wet but not prohibitively. The sun did not come out from behind the clouds at all unfortunately. But, no matter. 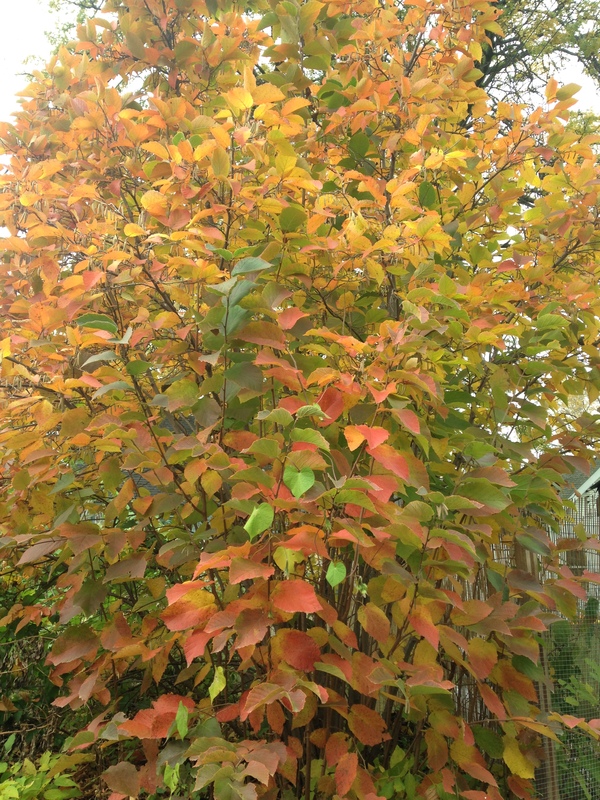 Between wind earlier in the week and rain yesterday, most of the leaves are off the trees and it is time to get around to putting the garden to bed. Even though we still have not gotten down to freezing and the forecast has no hard frost in sight, most plants have decided it is time to be done for the season. In the front yard I cut back all the perennials on the boulevard beds. Bookman swept all the leaves up from the sidewalk and cut back perennials in beds next to the house. Tomorrow will be gutter cleaning. In the garden I had my helper chickens following me around. We pulled out the pole and bush beans, arugula, zucchini, and tomatoes. Marianne discovered why Elinor and Margaret follow me around when I am pulling stuff out. Marianne is not shy and she and Elinor exhanged heated clucks a few times when they were both going for the same bug. Nothing like being bent over pulling plants out and having two chickens arguing under your nose. All of the chickens are happy about the cleared beds because more places to scratch for bugs! And I am happy for them to scratch away because they are also depositing a bit of fertilizer which will make next year’s plants happy. I picked the last of the habenero peppers. And the cowpeas that were still lush last weekend collectively decided to be done and all died. I picked the pods that were remaining on the stems, not all of them dry. I will let them dry out and then finish shelling all of them. Nothing else in the garden to pick now expect for fava beans. 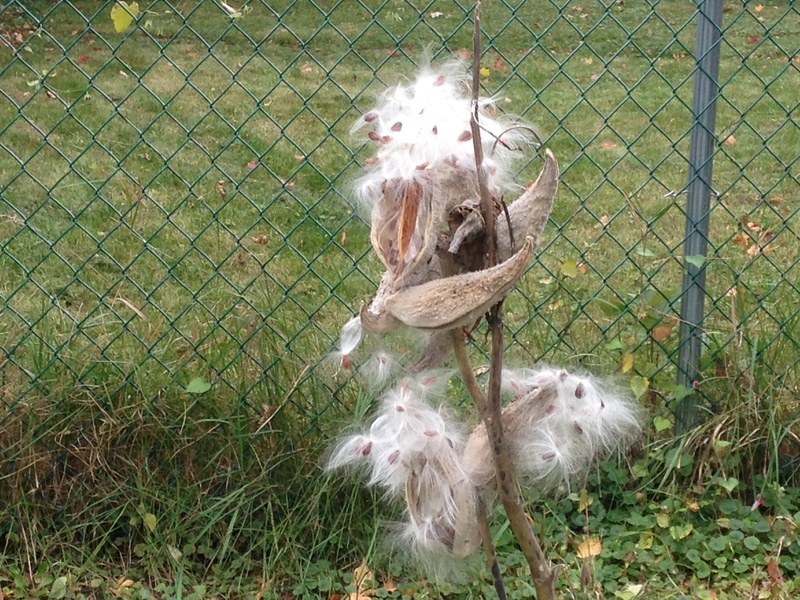 They really like the cool weather and are blooming and producing big bean pods. The longer it takes to freeze, the more fava beans I will get. I’ve not grown them before and didn’t plant many. I also planted them rather late. Next year I think I will plant more of them a week or two earlier which means mid-July instead of early August. And all those tulip and crocus bulbs Bookman and I planted on the chicken coop green roof? Judging by the number of holes in the soil, the squirrels have been digging them up and eating them. I didn’t see any bulbs or bulb pieces so I am crossing my fingers that I am wrong and all the little holes are from squirrels burying stuff instead. Hope springs eternal in this gardener’s heart. The days are too short to go out in the evening and for long Saturday rides I have to start in the dark and cold with lights and layers and I end up with too much gear to make an all-day ride fun. Cycling will be indoors now until spring. Sigh. This week I attempted my first time trial. I came in last in my group but I had a good time. Part of the problem was the group I wanted to race in was category D which is below my ability. I didn’t want to go all out because I had done a hard workout the night before and didn’t think I had that much oomph in my legs. So I raced to make sure I was just under the allowed watts per kilogram for cat D. But I couldn’t fool the computer apparently because it knows what my actual FTP is (fitness threshhold power) and bumped me up into category C otherwise I would have won cat D. Oh well. What’s a time trial you may ask? A time trial is basically you against the clock. Well everyone against the clock. Unlike a road race, there is no drafting, no peleton. It is an individual race (unless it is a team time trial) and the objective is to cover the distance as fast as you can, faster than the other riders do. Whoever has the best time, wins. The race I was in was 10 miles/16 km. It’s about pacing and how long you can hold that pace. It’s fun because in some ways you ride your own race and don’t worry so much about everyone else. The time trial took place on Zwift. A number of people last week had some questions about Zwift so during my workout and endurance ride that followed I snapped a couple of screenshots. This first one is during my workout. Zwift has a lot of sturctured workouts from individual one-offs to race prep and a series to increase your FTP. On the left is the workout segment. The arrow is pointing to where I was in the workout when I snapped the photo. The stars are next to the segments I completed. If you fail a segment you get a big red “failed” pop up on the screen and no star next to the segment. The box on the top middle of the photo is current information — speed, distance, elevation ridden, time riding, time left in the interval, how much power required for the interval and how much power I am putting out, heart rate (I was wearing a heart rate monitor) and cadence (I have a cadence sensor on the bike). On the bottom of the screen is a visual display of the workout as I proceed. The wavy red line is my heart rate, the blue was the power from the segment prior to the one I was doing when I snapped the photo, and the yellow is the current segment I was riding. The colors indicate training zones with blue being an easier, rest period and yellow being the zone just below my FTP. On the right you can see the grade of the course, a mini graphic represention of the course, and a list of the riders nearby and how far ahead and behind me they are. My jersey indicates that I have the queen of the mountain and the best sprint time for women in that last hour. This is a really awesome thing. Because the times on the leader board only last for an hour it gives more people a chance to wear a special jersey. And here is me after my workout is over just riding along. Now on the top left instead of the workout intervals is a box with my raw power output, cadence and heart rate. The helmet in the circle next to that box is a power-up. This is a game after all, and you can earn power-ups that you can use to be more aero, get an extra draft, or be lighter. You can see I no longer have the special jerseys but I like to match my bike to my kit. I am also riding behind a couple other people. We are coming up out of the underwater tunnels. There is in-game texting that allows me to chat with the other riders either as a group or a direct message if I don’t want others to see it. You can see my jersey pocket is kind of bulging and has some blue glow coming from it. Those are ride ons. Ride ons are big blue thumbs that appear above your head before shrinking down into your pocket. You give them to others and get them from others as a “good job” sort thing. Also a thanks for letting me take your wheel up the hill, or it was nice riding with you for a little while, or encouragement, that kind of thing. You can also follow people so you know when you login to the game if your friends are riding. There is a mobile app you can open any time without entering the game to see if anyone you know is riding and you can give them or anyone currently in the game a ride on. 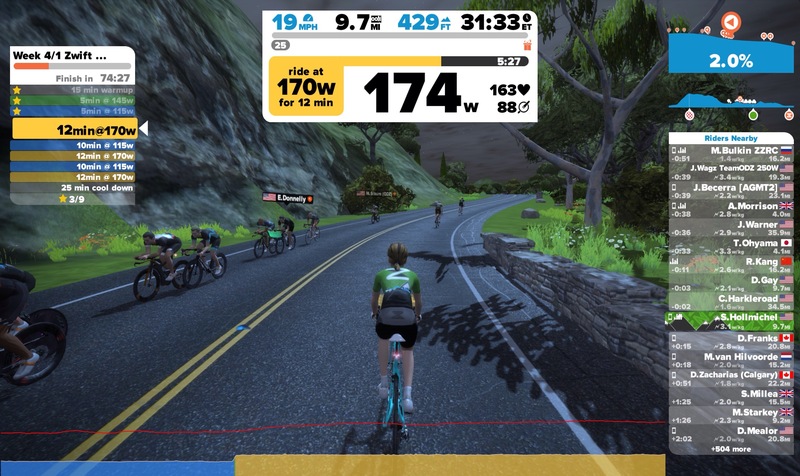 Besides workouts and regular riding, folks on Zwift also organize group rides and races like the time trial I did. There are also stage races (take place over a couple of days), and a race series where you can earn points and then at the end of the series the one with the most points wins. You don’t actually win anything other than admiration from your fellow participants, but that goes a long way since there are quite a lot of Facebook groups that have sprung up attached to various races, group rides, and teams. Sometimes there really are chances to win things like that Cervelo bike I rode 180kms for a chance to win last weekend. Last month there was a chance to win tickets to Ride London next summer, a big multi-day bike event in London. 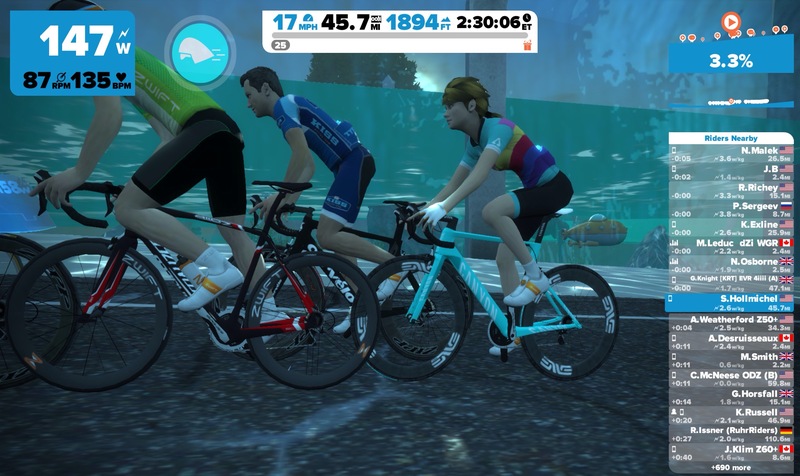 Zwift has a virtual version of the Ride London course and to enter riders had to ride the virtual course. There is also a virtual UCI World Championship Richmond, Virginia course. New routes and courses are always being developed to keep things interesting. Currently in the works is a plan for people with smart treadmills to be able to run Zwift courses. So even if you are not a cyclist, you will eventually get the chance to be part of Zwift too. Now you know when I talk about riding on my trainer what I am doing. It’s great fun and I have made cycling friends from all over the world. Maybe one day I will get to ride with some of them in real life. I’ve been doing the same in my garden this weekend and I got bitten by midges! We’re due to have our first frost this week, I bet it doesn’t kill the midges. I’m in awe of your cycling feats. piningforthewest, oh midges, poor you. I am glad to not have those! We have mosquitoes as big as flies but there haven’t been too many lately for a change. And thanks! Five years ago I never would have imagined I’d be cycling this! It must be nice to have the Chickens to help around! I love these virtual races! Its makes the activity so much for fun and the encouragement you receive keeps you going!! Go Stephanie! And wow! Zwift is really cool! Makes cycling indoors not sound so bad! Wanderwolf, Zwift keeps indoor cycling from being so very boring and has created a fun community. Good night garden, now it’s time to start dreaming for spring! Hah–chickens–nature’s solution to irritating insects! And they are amusing, too. (The chickens that is). Too bad they can’t give those greedy squirrels a good talking to! I always have wondered what your virtual cycling was like–how cool. And it would be fun to have an international cycling meet up! Danielle, the Dashwoods will scold the squirrels if they get too close them for too long but most of the time they all ignore each other. The bugs in the garden are no longer safe! Even the worms are in danger. Zwift is really neat and some Zwift friends have become Facebook friends. It would be so much fun to meet up and cycle in Europe or Australia or even somewhere in the US. One day I hope! Wow. Zwift sound really fun. I would even be interested in checking it out as an alternative to boring treadmill walks. Michelle, it is really fun and there are always contests and challenges and stuff to help keep you motivated. Sara, lots of Zwifters have used those and still do to mix things up but once the Zwift bug bites it is hard to want to try anything else. Hope you like it! If you do, look me up! I too was a Sufferlandrian, but have now immigrated to Watopia (or London, depending on the course schedule) and become a full citizen of Zwift.